I was asked to listen to some 1960's recordings made of bird calls in Canada. To do this we had to dust off the reel to reel machine which has been languishing on the top shelf of the store cupboard for years. Listening to the recordings made 40+ years ago it took my mind back to my younger days when my parents had a reel to reel machine and I'd watch the tape on the spools increase or decrease depending on which direction they were going. Somewhere in the recesses of a box at home are recordings my parents made on their machine of Christmas parties and so on. 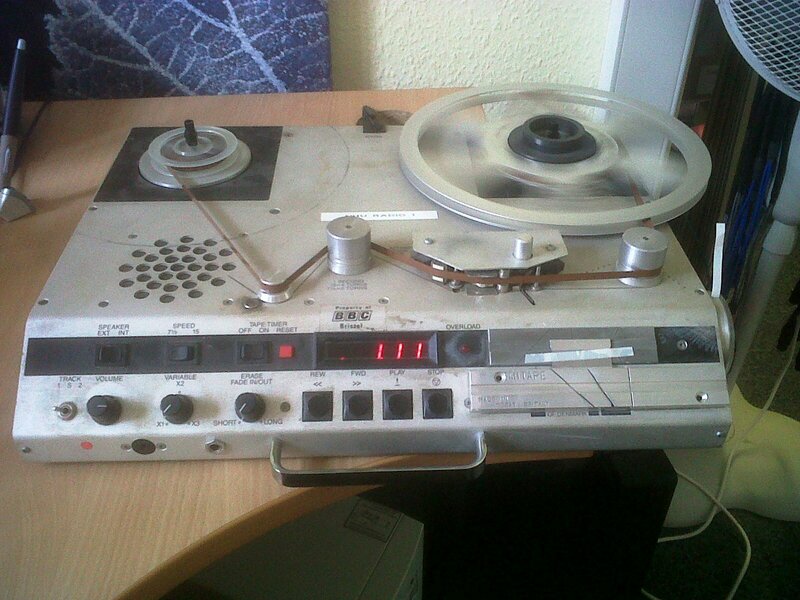 My father was a great one for recording events on tape. I must retrieve them and find out who or what is on there. Many of those I guess will sadly be long gone to the great audio machine in the sky. I love old technology and using this machine at work was joy. All moving parts, easy to work out how it works, no manuals or complicated handsets, or Windows XP programmes to crash. Just a mechanical machine, some spools and a tape. Not all of the past was good, but I think we have lost something of the simplicity of life with the arrival of ever more complex computers. I love computers, after all I'd not be able to blog if we still had pencil and paper, but just now and again using something which is simple is a joy. Speaking of the past, while researching subjects on Greenland this week I discovered, there is a culture called the Dorset culture. The Dorset culture (also called the Dorset Tradition) was a Paleo-Eskimo culture around (500 BC - AD 1500) that preceded the Inuit in North America. and why were they called the Dorset culture? Well in 1925 they were discovered in Cape Dorset, Nunavut, by anthropologist Diamond Jenness. And so as this is a blog about Wessex, an area Thomas Hardy created as he lamented the passing of the old ways, I found this by a Canadian poet, the late Al Purdy who wrote a poem entitled "Lament for the Dorsets" This poem laments the loss of their culture and describes them and their end. Need I say more. what was happening to them? Sitting in a caribou skin tent– the last Dorset? Another relaxing weekend. It's been a while since I've spent a weekend just pottering about. The thing is our pottering about, seems to be most other people's idea of a full scale expedition. This Saturday was one of those such quiet days. After a bit of a shopping tripette to Wells, in Somerset, which seemed to involved many hours in the Good Earth Cafe reading the Saturday papers and precious little shopping, we tootled off down to the North Somerset Ploughing Match at Brockley, just outside Bristol. Julie is a bit of an equestrian fan and my saying there would be heavy horse ploughing at the event, swayed her to accompany me. The thought of spending an afternoon with me getting excited as I stood in a field with many oily ragged boiler-suited gentlemen of the soil, doesn't readily appeal to a refined lady of breeding. But mention there will be horses there and she's brushed her hair and in the car faster than a pickled onion drops into a vinegar substrate. I love ploughing matches and wrote about this self same event last year. By far the bulk of those ploughing on Saturday were vintage tractors (some of which were new to the agri-market when I were nowt but-a lad in farming, and now are seen as quaint ancient machines - makes me feel old). But as ever, it's the horse ploughing teams that get all the patting and ooing and aaaaarring. And I have to say, who can blame them. Watching heavy horses ploughing is a wonderful sight, and not for the feint hearted. Heavy horses may be the gentle giants of the equestrian world, but there are some serious muscles under their sleek coats all controlled by a few leather straps and quiet words from the ploughman. Just wonderful to watch. And it's a good job the weather forecasters managed to yet again get the weather completely wrong for Saturday otherwise Poppet and Sam's harness brasses would have been soaked. Speaking about things with rippling muscles under their sleek coats, this fan of a good ploughman's lunch hove into view to tickle Poppet's ear. Shocking! But to give you time to recover from that unfortunate image, here is another of the team back in action. After all that's why we'd come here. But of course there were tractors too, and this model was the very first tractor I ever drove as a nowt but-a lad 12 year old on Harry's farm in West Boldon, between Sunderland and Newcastle. Happy days remembering the excitement of being a 12 year old and knowing exactly what I wanted to do as a man - and so at 16 I left home, moved to a hill farm in North Northumberland and became a farm student. The best experience of my life. I asked herself to photograph me next to this Fergie and made her promise to put it on my Christmas present list. I'm awaiting the answer! Not long after this we had a sniff the silage moment, actually more than one such olfactory moment (while perusing the produce event of the show). Silage was my nickname at Durham Agricultural College and the smell of it still makes me revert to warm summer days rolling the silage clamp in a Fergie, or frosty winter mornings opening the clamp before dawn in my Leyland 272 to feed the cows breakfast in the hemmel, and that sweet scent of summer wafting over me in midwinter. Good memories. That was the afternoon. We popped home for a cuppa and then headed down into Dorset for a sit on our favourite hill. There was a reason for doing this today, and it was successfully achieved. When we got there it was about 7pm and the sun was beginning to set. I'm not a spiritual person normally, but that hill is such a spiritual place for me and has been for 30+ years, I can come to it time and time again and it always changes it's mood, it seems, to reflect mine. I brought Julie here in March for the first time and she too has now fallen in love with it's timeless atmosphere. While Julie headed off for some quiet reflection, I managed to take some sunset photos. I like this one above of her walking alone on the hill as the sun finally reached the horizon. As she said, somewhere the sun was rising, a never ending cycle. And I quite like this one below of the clouds, as we looked out towards the sea, just after the sun set. Not all the photographs I take with this new camera work. Digital skies are difficult to capture if the main subject such as vegetation is in the wrong spectrum. Often the camera is fighting to correctly expose on the subject and so the sky then becomes burnt out. Get the sky to be perfectly exposed and coloured, often means the subject is in silhouette. Manual photography will compensate somewhat, but that takes time and fiddling. So this photo below is a classic case of the former problem. There was wonderful sunlight reflecting on the fence and grass heads but try as I might, because I had to face the sun, the sky is just burnt out. But all is not lost. As an actual representation of the image on this September evening this was rubbish. But by the magic of digital manipulation in post production, the following effect was achieved, more like a moody misty winters day - the sunlight changing for frost. Well I think so. I wonder what do you bloggers think? Who says the camera never lies!! By 9pm we were sitting in the dark at the hill so decided to end the night down at West Bexington beach where from just past 10 o'clock we sat for half an hour in the dark listening to the waves crashing on Chisel Beach. Around us were fishermen casting into the high tide (and apparently the fish were not being caught) and the night sky was crystal clear. There were millions of twinkling stars overhead, the Milky Way was as milky as I've ever seen it and as we sat on the shingle, not one but 4 shooting stars past overhead. I love this part of Dorset, absolutely love it. And sharing it with Julie these days adds such a wonderful dimention to my love of this area. But let me end this posting back in the afternoon of Saturday and a celebration of heavy horses, pulling the plough........ when the oil runs out, these gentle giants will once again be the backbone of human kind. And well deserved too. I thought with this posting I'd be a little bit self indulgent and go through a drawing I made over the weekend and the very haphazard unplanned way I work. Yesterday afternoon I found myself indoors for a change watching the Burleigh Horse Trials on BBC2. I do like a good three day event. Anyway sitting still for more than 2 minutes is difficult for me, but yesterday for the first time in a long while (actually since Good Friday) I unleashed my 2B pencil, some heavyweight cartridge paper, a mug of tea and while watching the TV began drawing. At the beginning of my drawing I had no idea what to draw, but as a horse jumped over a five bar gate and a fence at Burleigh, I began with a five bar gate, and from that beginning a fence emerged and the makings of a tree. Onward I went. Filling out the tree and then a link fence, some back ground and then a second tree in the field. At this stage I still planned to do a summer tree, i.e. one that is in leaf. But that never happened, possibly as it was more like winter out there than early autumn. So now my trees will be sans foliage, what else can I add? How about some rooks ! Yes that's not too bad. It lifts the drawing and gives it movement. Adding some shadows and a few more defined branches at this point I thought yes this doodle is now just about finished. It wasn't meant to be a massively polished drawing, just a sketch really while I watched TV. And then I broke a golden rule. All paintings, drawings and sketches suddenly shout out to the artist, "stop, please stop I'm finished now". At this point do not fiddle about any more or add anything else. But then I did and added a few more rooks which wasn't too bad, and then in a moment of madness some empty rooks nests in the front tree. And that's where I overcooked the drawing, and yet again I've learnt a valuable lesson in drawing and artwork "know when to stop". And yes if you are wondering I only used a single 2B pencil...... my art comes cheap! Mind you I don't think Molly was too impressed!! I was up at 6am this morning and greeting me was this fabulous sight. I live under the London - Atlantic airway, as many planes use the Bristol Channel as a marker for trans-Atlantic flights. In the good old days concorde could be seen overhead followed sometimes by the distant boom as it hit the sound barrier over the sea. Early every morning sees many vapour trails across the skies on this part of the Somerset coast as the early morning flights gain height. One day I counted 27 such trails high up in the sky at one time with 3 being made there and then. But today the beauty of the vapour trails were highlighted beautifully in the gathering sunrise. This morning's sunrise wasn't the only stunning one I've witnessed recently. A week or so back this unbelievable "red sky in morning" broke about 5.30am. And the rhyme was indeed correct that day. By 2pm it was raining a complete monsoon which lasted for 3 days here. I'm so glad I get up early to catch such natural spectacles - life is never dull when this sort of thing occurs.